The Vancouver community showed its support for schools on Tuesday, Feb. 14. The $458 million bond measure is currently passing with nearly 70 percent approval. 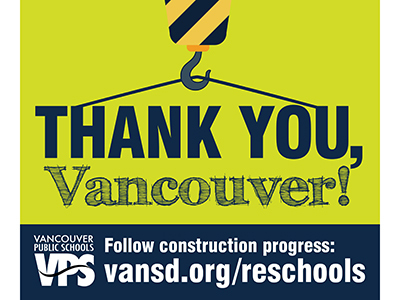 Voters overwhelmingly approved the capital construction bond measure for Vancouver Public Schools with 69.74 percent (updated 2/16/17). Validation of the measure came a day after the election. An updated ballot count provided the required 27,000 votes to validate the measure. VPS has received a total of 28,660 votes, 19,969 of which were “yes” votes. The election results will be certified on Feb. 24. The estimated cost of the entire bond program, which includes improvements to every school in the district, is $562.8 million. This total cost is offset by other revenue sources including a $43 million class-size reduction grant from the state, local impact fees estimated at $12 million and state assistance funds estimated at $50 million. The last bond measure in VPS was passed by voters 16 years ago in 2001 with 63.3 percent “yes” votes. That $87.7 million bond helped pay to replace Eisenhower, Franklin, Hazel Dell, Salmon Creek, Sarah J. Anderson and Washington elementary schools, and build Thomas Jefferson Middle School. The construction schedule prioritizes eligibility for state assistance funding and completing projects on time and within budget. The scope of the ambitious timeline is anticipated to be six years, from spring 2017 to 2022, barring any unforeseen circumstances. Work will begin right away on designing and permitting for the replacement Marshall Elementary School and McLoughlin Middle School, and a permanent building for Vancouver iTech Preparatory to be located on the Washington State University Vancouver campus. Upgrades and enhancements at 25 district schools will begin this spring and continue over the course of the six-year timeline.